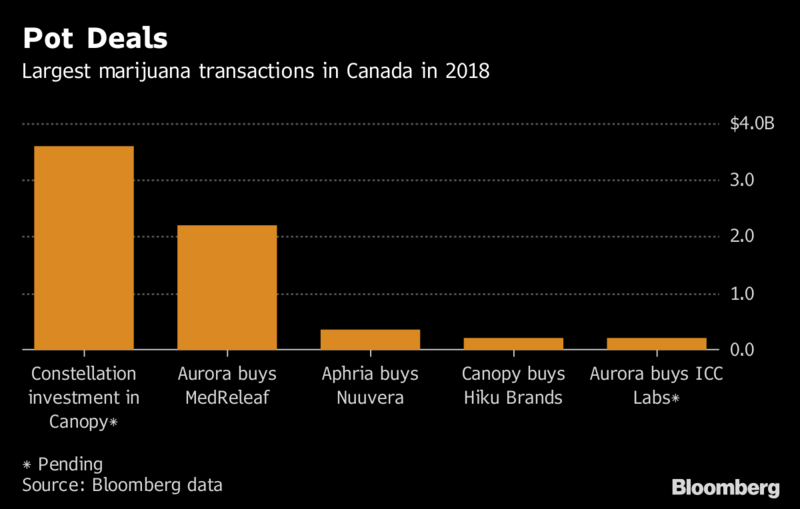 Marijuana has fueled about US$8 billion of deals in Canada this year, with Canopy Growth Corp. and Aurora Cannabis Inc. among the most active. Canadian cannabis companies have been involved in at least 97 announced acquisitions and investments with a combined value of US$8.06 billion this year, according to data compiled by Bloomberg. That surpassed activity for all of 2017, which saw 31 deals valued at about US$1.16 billion, and the US$361 million from 27 deals in 2016. In 2015 there were six pot deals worth US$72 million. Dealmaking has picked up as Canada legalizes marijuana for recreational use on Oct. 17. Many analysts expect it to accelerate further as a handful of stronger companies emerge from the stock-listing frenzy over the past few years. Almost half of this year’s amount is from Constellation Brand Inc.’s investment in Canopy Growth in August, the industry’s biggest deal to date. That transaction made Greenhill & Co. Inc., Canopy’s adviser, the top dealmaker for pot deals this year, while Goldman Sachs Group Inc. took second for advising the New York-based maker of Corona beer. Canaccord Genuity Group Inc. ranks third for advising on pot deals followed by Bank of Montreal’s BMO Capital Markets, which was exclusive adviser to Aurora on its all-stock deal for MedReleaf Corp. in May. GMP Capital Inc. ranked fifth. In terms of financings, some of the biggest this year include Canopy Growth’s $600 million sale of convertible notes and Aphria Inc.’s $258.8 million share sale in June. Aurora did a $230 million sale of convertible debentures in January, the same month Canopy raised $200.7 million in a stock sale.